Put simply; technical (‘tec’) diving means going beyond recreational scuba diving limits. A standard axiom of recreational diving is that we are never far from the surface – in the event that we encounter a problem we can go directly up to the surface and to safety (albeit at a slow and steady pace). Technical diving can be described as diving under a ‘ceiling’. In some cases this ceiling will be a physical barrier such as a cave or shipwreck. Even if a physical barrier is not present, tec divers will go beyond the standard recreational no-decompression limits, meaning that a direct ascent to the surface would not be safe. In this case we can assume that a physiological ceiling exists. Why do people do Technical diving? There is no doubt that Tec diving isn’t for everybody. How do you know if it’s for you? The appeal of technical diving is in the challenge and adventure of exploring parts of our ocean which most people will never see. This, of course, involves extra risks and therefore a higher standard of precision in our actions. For many divers this is enough to put them off Tec diving, whist for others this is exactly where the appeal lies. If you are an experienced diver who wants to go beyond your current limits and are willing to accept the added risks, training, investment and commitment it demands, then PADI TecRec courses are your ticket to extreme adventure. 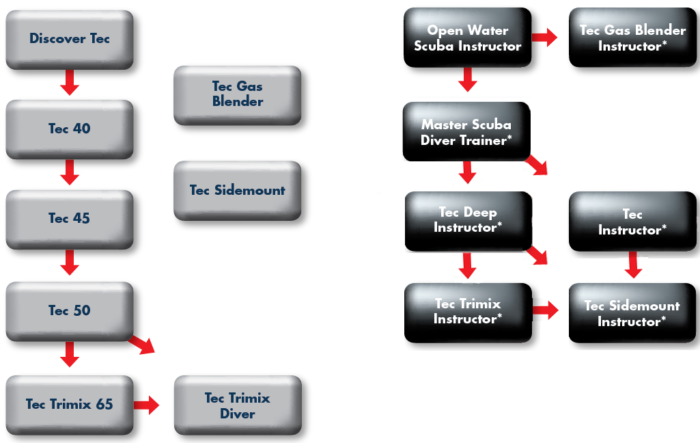 As you can see from this chart, there are several levels of Technical diver training. If you want to ‘try before you buy’ then you can enroll in a Discover Tec programme, which introduces you to the basic theory, equipment and ethos of technical diving. This optional experience programme is a great way to begin if you are curious but unsure if you’ll really like Tec diving. Once you’re hooked, then the training is broken down into stages; each building on the last. As you progress through the various courses you’ll gradually build your competence, confidence and the scope in which you can utilise this training. Starting at Tec40, you’ll learn the basics of using the equipment and hone your skills in time-management, gas-management and buoyancy control. Tec 45 and Tec 50 build upon this foundation, each allowing you to dive deeper for longer and breath increasingly rich Nitrox mixes in order to accelerate your decompression. All of these courses can be completed using backmount or sidemount cylinder configuration.